It has been a while since I’ve updated this blog, but that’s to be expected. I now have double the number of children I had before. How does it work out to more than double the work? I’ve found that being “crispy” has taken on a whole new meaning. Mothers who take a more “natural” approach to parenting are labeled as “crunchy” or “crunchy granola.” Well, we can’t be crunchy granola because we’re Filipino and we don’t eat granola that much. So I guess we’re “crispy bata,” which is a play on “crispy pata,” a pork thigh dish from the Philippines. “Bata” means child. Which means my children are just crispy children, and I’m a crispy mama. Not quite crunchy, but almost! 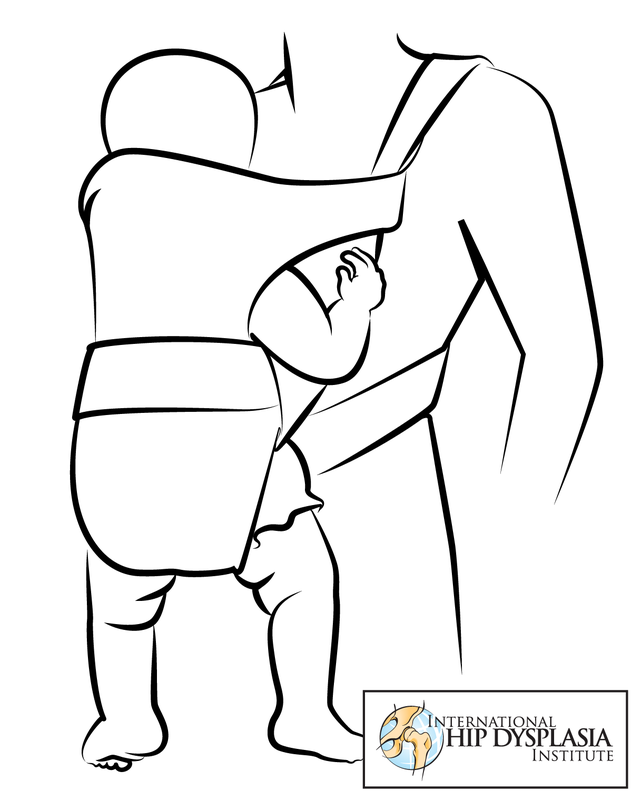 One skill that is off the mainstream that I have adapted much more readily this time around is babywearing. That means attaching your baby to your body, rather than pushing them in a stroller or holding them in arms. This is very useful for many reasons. First, I don’t need to utilize ramps to travel. I can walk stairs; I can probably navigate a ladder if needed (but I wouldn’t choose to). Secondly, I can see my baby’s face, and she can feel my heartbeat. Babies, especially newborns, are most content when they can hear their mother’s heartbeat, just like the womb. 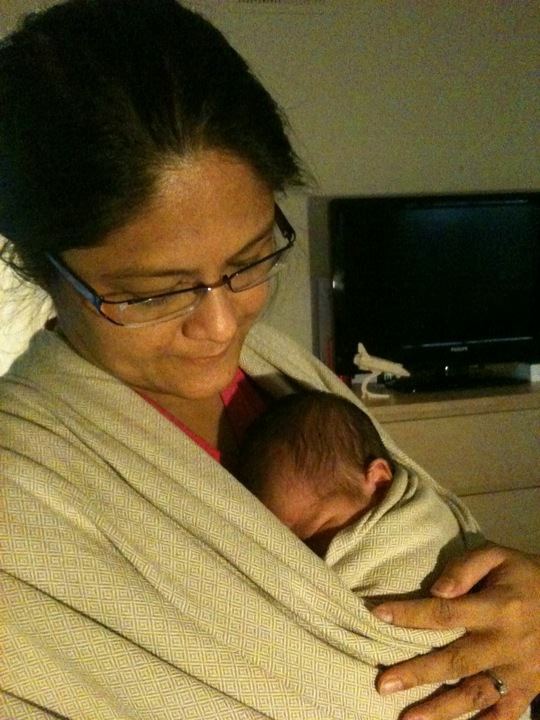 Wearing Audrey in a ring sling and holding Gavin's hand. Third, it frees up my hands to hold my older child’s hand or to tend to him in other ways. This also means that my arms aren’t killing me after 10 or 15 minutes. This particular ring sling, as you can see, distributes weight over my shoulder and back. At the time, Audrey was probably around 12 lb., but I could wear her in that sling for an hour and be comfortable. 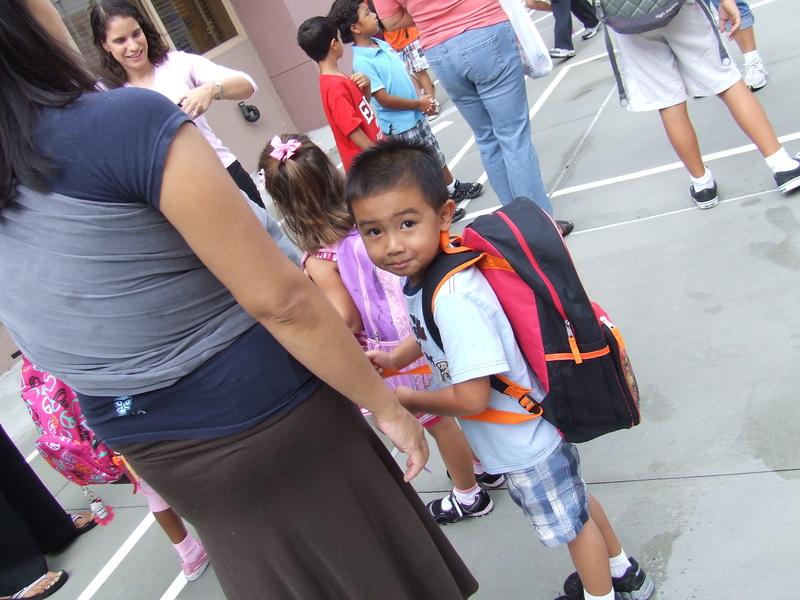 As she got heavier, I moved on to carriers that used two-shoulders, which provide more support. Baby's legs are straight, putting all weight on the crotch area, rather than being distributed over the bottom and thighs. 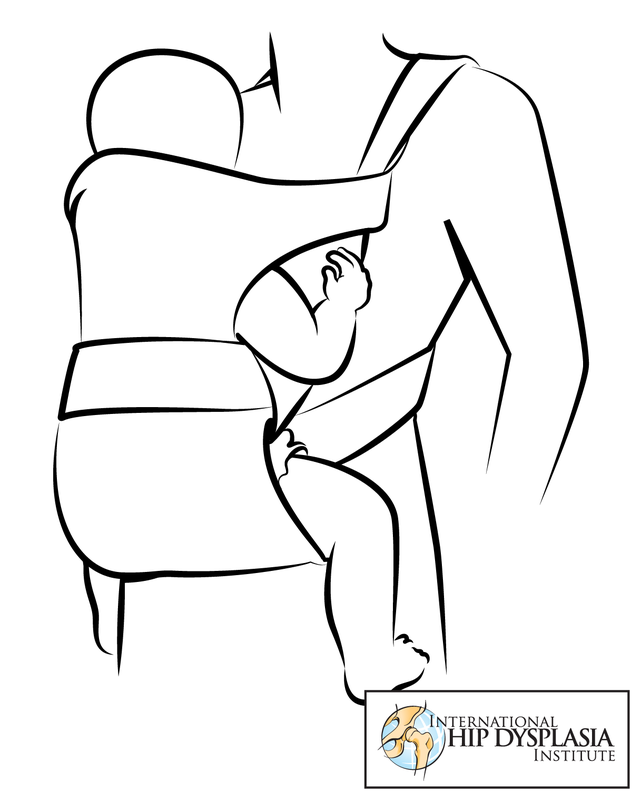 Proper babywearing - baby's weight distributed over bottom and thighs; knees are at or above bottom. I am very fortunate to be a part of BabyWearing San Diego, which is a nonprofit organization that does outreach and promotion of healthy babywearing. The organization holds informational meetings almost every week in different parts of San Diego County. The organization has a lending library, full of carriers that are safe for both baby and parent to use. The leaders are so helpful about finding the right carrier and showing novices how to use them. It is a collegiate environment, where moms (and dads or other caregivers) share their experiences and advice.